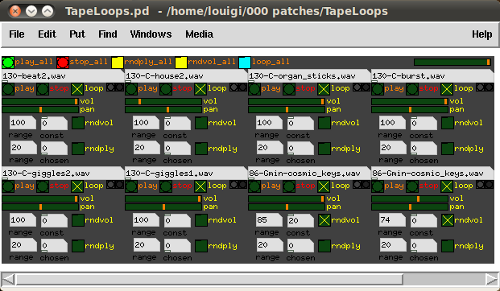 Tape Loops is a Pure Data implementation of Tape Loops I did for Windows a while ago and which does not work under GNU/Linux. Pd Tape Loops has more functions than the original concept application. Most GUI elements should be self explanatory. Pan parameter doesn't do anything yet! The only thing that needs explanation are the gray and dark gray buttons. The gray button opens a file in the last visited location. The dark gray button opens your main sample folder. 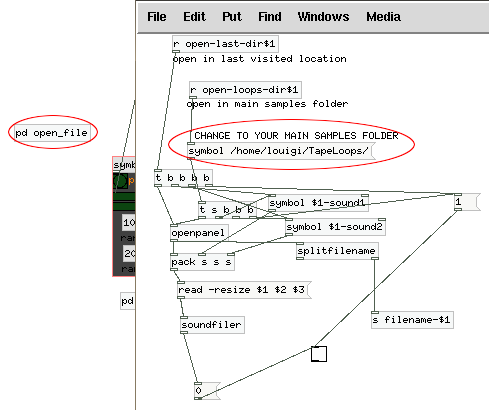 To define your main sample folder, go to t_looper.pd, there into the subpatch displayed on the image. Unfortunately, Pd at the moment of writing this patch does not have multithreaded architecture - at least, so I think it is called. GUI and sound processing are in the same thread. This results in interruptions in audio when you load another file. I tried several solutions but none of them seem to work reliably. At this moment it is better to load all the required files beforehand. This is the main problem with this patch and with Pd in general.